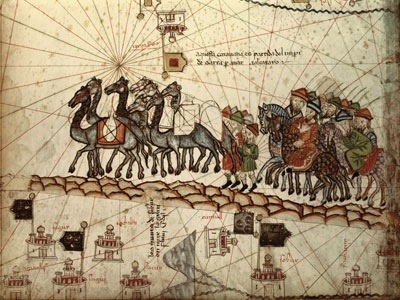 When last we followed the Polo Brothers, the predecessor adventurers of the renown Marco, they had been outed ‘Caucasian’ and promised a “molestation” free all expense paid journey to visit the great Kublai Khan in the East. Rusticello da Pisa (if you’re still with me, the convict turned author of The Travels of Marco Polo) assures us that Pops and Uncle Polo saw many great things on the year long journey to the Khan, but ain’t nobody got time to document that, and, besides, “Messer Mark, who has likewise seen them all, will give you a full account” later. So tune in later for that. In the mean time, imagine rainbows, raptors, and cheesecake. That’s what they have over there, right? So anyway, fast forward to the court of the Great Khan where our heroes are met with honor, hospitality, and a riveting game of 20 questions. And no sign of cheesecake, my bad. The reason Kublai was so interested in making friends with people who habitually drew fish in the dirt wasn’t to throw a lavish Christmas party. He was inviting them to knock on his door and provide logical discourse in comparing the Law of Christ with all those other hokey religions. If they were successful in proving the superiority of a relatively adolescent and already fractured religion over other ones, than he would gladly convert himself and his people to Christianity. Also, he really wanted some Oil from the Lamp that burns in Jerusalem on the “Sepulchre of Our Lord”. If you forget the oil from the lamp than I will SEND IT BACK. 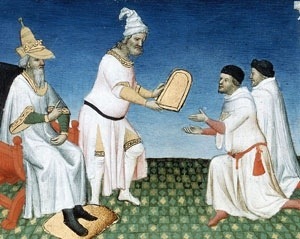 Kublai sent his new Polo owls on their way with a Tablet of Gold (shown above with a very white looking Khan) which worked like a passport and just to remind everyone of how badass he was. Good thing too, because the Khan’s probably “green” Baron who was accompanying the group got sick and was not at all suspicious that the Polo brothers were totally happy and cool with going on without him and taking the shiny gold tablet with them. Well, apparently they journeyed for three years. (Mmmhmm. I know, right? More like journey straight into a BROTHEL for 3 years) When they finally arrived in Acre (a major Crusader Kingdom) in 1269 AD. When they got there they learned that the Pope who Kublai so desperately wanted to makey friends with was dead. Like, really dead. Whoops. To be continued. And also, WHERE IS MY OIL FOR ZE LAMPS? !